Patterns Pieces - Get your FREE pattern HERE! STEP 1: On TOP LINING (2), finish the bottom opening with a small zig-zag stich or serge it. (This opening will be used to insert and remove the swimwear cups). STEP 2: Pin TOP (1) to TOP LINING (2), WRONG SIDES TOGETHER. Baste with a small zig-zag or serge it just outside seam allowances. STEP 3: Cut 4 pieces of elastic, using ELASTIC GUIDE (5). Pin elastic to WRONG SIDES of top along sides, having ends even. With elastic on top, sew using a short, wide zig-zag or serge. Make sure to pin the beginning and end of the elastic to the beginning and end of the sides, stretch elastic as needed. STEP 4: Fold NECK STRAPS (3) and BACK STRAPS (4) in half lengthwise, RIGHT SIDES TOGETHER. Stitch long edges with a very narrow zig-zag or serge. Make sure to stretch the fabric while you sew. Turn RIGHT SIDE OUT with a loop turner of safety pin. STEP 5: With RIGHT SIDES UP, lap upper edge of TOP (1) with NECK STRAPS (3), centering strap. Pin in place. Sew the neck straps to the top. Make sure to backstitch a few times. Fold the upper edge of TOP (1) in half. Sew a diagonal stitch, backstitching at least twice. Cut seam allowances close to the stitch. Turn. STEP 6: Turn elastic to INSIDE on the 4 sides that you stitched the elastic. Top stitch elastic with a medium zig-zag ¼” (6mm) from fold, stretching as you stitch. Keep fabric pulled taut over edge of elastic. STEP 7: On the bottom of TOP (1), fold over 5/8” (1.5 cm), RIGHT SIDES TOGETHER making a casing. Make sure you don’t close the opening completely; you’ll need it to insert the cups. Insert neck strap in casing using a bodkin or a safety pin. You can either tie the top to the back or to the front. STEP 8: Optional – Roll the swimwear cups and insert them through the bottom openings. STEP 9: Optional - Cut the ends of the back and neck straps diagonally and insert the cord ends. Using a pin to pull the strap is helpful. Tie a knot on each end and cut the remaining close to the knot. This top was made using a this electronic sewing machine from Brother. 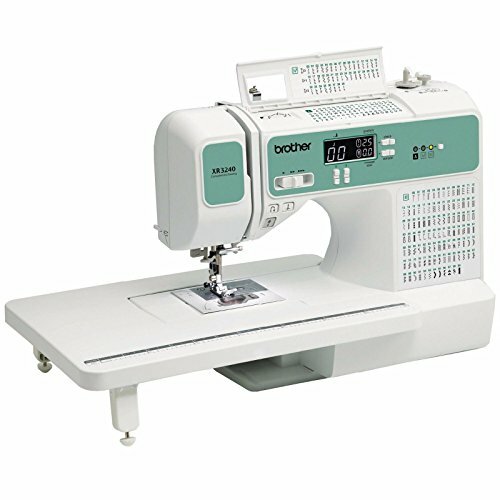 It has automatic needle threader, 140 stitches, adjustable speed (great for beginners and more). You can even "serge without serging" with its overcasting stitch! YOURE BIKINI TOP IS FINISHED :0) Time to go to the beach or pool! Please let me know what you think on the comment section below! What other tutorial would you like me to show? Pin, Like and Share!